KEURIG K ELITE REVIEW | IS THIS THE BEST KEURIG YET?! Keurig K-Elite Review | Is this the best Keurig yet?! 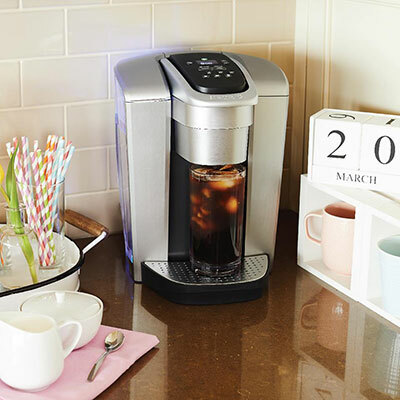 The latest addition to the k-cup system, a Keurig iced coffee maker that makes iced coffee and stronger brew. Not only does this machine brings some nice design details, it also meets consumers’ demands for making iced coffee or stronger brew at home using k-cups. The $169.99 Keurig K-Elite is constructed of metal and plastic. Its design easily blends in with contemporary kitchen decors and it’s sturdier than other k-cup models. It’s a definite improvement over the previous design. The water tank holds 75 ounces and it’s removable which makes it easy to rinse and refill. While the k-cup holder looks the same, the area around the holder is slightly easier to wipe than it was before. Buttons are placed on top for easy controls. 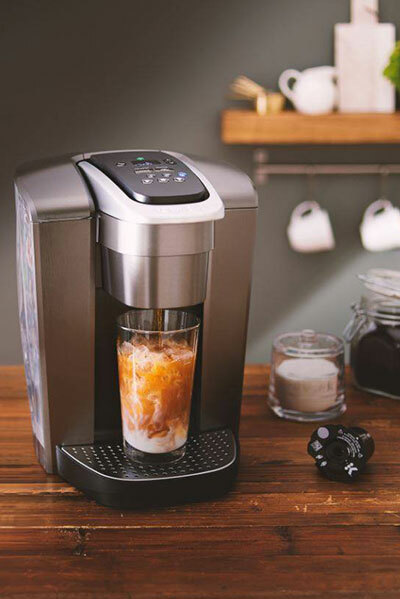 Besides 5 different cup sizes and 2 dedicated buttons for iced coffee and hot water on demand, there’s auto ON/ OFF option so you can set a time to have the coffee maker ready when you get up or save energy. The K-Elite retails for $169.99 and comes in several colors: brushed silver, brushed gold and brushed slate. There’s also a limited edition with different finishes on handle and drip tray: iron, slate and chrome. Since it shares the same basic design as all Keurig machines, the K-Elite is just as simple to use. It accepts all regular k-cups, as well as reusable k-cup filter. There are 5 different cup sizes to choose from 4, 6, 8, 10 and 12 ounces. It lets you control water temperature (it has a range between 187 and 192 degrees Fahrenheit) and coffee strength. For bolder brew, just press the Strong button before selecting your brew size. The K-elite can do only single cups and it’s not compatible with Keurig carafe. At this time, K-Elite is the only Keurig with iced coffee option. The iced coffee button makes hot coffee in small concentrated amounts, right over ice. While you can make iced coffee with any Keurig model (I shared my recipe here), some people prefer to have a dedicated iced coffee button. 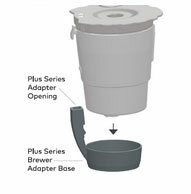 The Keurig K-elite is compatible with universal reusable k-cup filter. To use a reusable k-cup in K-elite, first remove the k-cup holder from the unit: lift the handle, grasp the k-cup holder and push up from below to remove. If a reusable k-cup won’t fit your K-elite, make sure the bottom is removed. Since this filter can be used in classic and plus series brewers, you need to remove the bottom of the filter to fit your K-elite machine. To remove, hold the filter on top and push down the Plus adapter opening firmly to unlock the base. Keurig K-Elite vs K-Cafe: The K Cafe doesn’t have as many options as K Elite – you can’t control the temperature, there’s no auto on and there’s no dedicated iced coffee button. That’s not to say that you can’t make iced coffee in K-cafe. While the iced coffee button on the K-Elite brews hot concentrated coffee directly over ice, you will use the Shot button to do the same with K-cafe. Plus, the built-in frother has cold froth option so you can make iced lattes with ease. Keurig K-Elite vs Ninja Hot and Cold Brew: You really must check out the new Ninja Hot and Cold Brewed System. It has 6 cup sizes – including carafe, 5 brew styles, a built-in milk frother and it also has a programmable auto on. It retails for $199.00 but with so many different options (it also brews loose leaf tea and tea bags) and the fact that it uses ground coffee and not the pods, you will save those extra $30 in no time. The Keurig K-Elite includes a limited one-year warranty for normal home use. To keep your machine in good shape, it’s recommended to clean the external parts or the brewer regularly and descaling it every three to six months. The machine has the maintenance reminder and will let you know when it is time to descale. Keurig K-Elite water filter: The K-Elite is compatible with Keurig Side Reservoir Water Filter. Water filter should be changed every 2 months or 60 tank refills. If you really need temperature control or auto ON option, Keurig K-Elite is currently the only model with these options. While you can make iced coffee or get hot water with any k-cup machine, having an individual button for each option is convenient. But at it does cost more than some other basic models like K55, which you can get for less than $100. If you have an updated kitchen, you might have a problem with this model since some units trip GFCI outlets. I purchased my first Keurig a year ago and it was the 2.0. It was wonderful and I never had a problem with it until the past month. All of the sudden none of the k-pods worked and it would have grounds in every cup or not fill completely. I cleaned it, changed the filter, cleaned out the needles, etc. Then I called the 1-800 number and was offered a new K-Elite machine free. I thought this was the best company EVER! Once I received the K-Elite it worked great for 5 k-pods and then started doing the same thing the 2.0 did. I was going away for the weekend and wanted my 88 year old father to have coffee, so I called back the 1-800 number. ( I had sent back the part from the old machine so I could not use it anymore) The guy asked me a bunch of questions and finally thought that it was the Folders K-pod that was the problem so he is sending me a new case. I told him that I was using Chai tea and hot chocolate and they were having the same problem. He said to try the new pods and to call back if the same thing happens once they arrive. So, now I have a great machine that heats water and that is it… I had to go buy instant coffee for my father to use with our new “water machine”. It is now Tuesday and I have been waiting 4 days for coffee pods to arrive in order for me to call the 1-800 number back and say that they did not work… I just want my old machine back- I know they no longer make them, but this is a complete waste of time. I even offered to go purchase a new pack and try it and call him back immediately, but they said no. I would appreciate them replacing the machine however, I would like one that has been laboratory tested already. My husband is ready to go purchase a Hamilton Beach Brewer. I’ve had my Keurig K Elite for 3 days. Turned it on this morning and the water is just running through it. It has emptied a whole reservoir of water. I’m very frustrated. I’ll be returning it to the store. I purchased a k elite. I’ve tried to use the my kcup which I had to look on YouTube to even find out how to remove the holder. But it doesn’t look like it will go in without breakfast no something. I purchased the K-Elite this past April. I love every feature it offers, especially the auto on feature. However, the auto on will work for a few days and then not. So at least twice a week, I have to unplug and reset. For this reason, I am returning to place of purchase and exchanging for a new one. I am hoping that this was just a flaw in the one I am returning. Thank you so much for the feedback, Susan! I am so frustrated with my K-Elite. Have had it about 2 months and now cant get a cup of coffee. 5 K- cups may get me 1 cup. Half way through the cycle, it spits coffee grounds in my cup with a blast. Called Keurig and they told me i had to use bottled spring water. Have had Keurigs for 3 years and have never been told that. Ready to give up. Hi Karen, I’m sorry to hear that and I agree with you, you don’t have to use only bottled water in your machine. If you use a water filter, there is no need to also use bottled water. Just make sure not to use softened water in your Keurig machine this can cause problems, but filtered water is fine. I recommend calling Keurig customer service once again and try speaking to a different Customer service representative, maybe he will be more helpful. I had the K475 and the digital display went haywire after 2 months. I had to wait for the water to heat up before I could put a pod in or else it would tell you to open and close to begin brew cycle.. Though the K-Elite does not have the carafe feature, It is much more user friendly. I can put the pod in while the water is heating up, close the lid, pick the size cup I want and when the water is done heating up, it automatically starts to brew. Autobon and off works like it should and the ice coffee function if the machine works well also. I honestly can say this is my favorite model so far out of 4 that I have used. How can this be the best Keurig yet when it doesn’t work with GOOGLE HOME and or ALEXA? Other competitors are starting to offer this and just about all new electronic technology out there today is compatible with google home and Alexa! Hi, I agree, I’d like to see that feature in the future. For this price you can get Behmor, it works with Alexa and it makes great coffee too. Exactly! See. Very cool. But it doesn’t work with google home? I don’t think it works with Google home. But you can control it with an app on your iPhone and Android. fastens to tank. Very loose. move the tank and it wiggles. flick it with your finger and it comes off. This can’t be right! Also the tank fits loosely and has some play. Is your machine like this? After you “Lock in’ the filter It does help stabilize the water filter. Are there any Kuerig machines that use the carafe. I bought the K475 2 months ago and the digital display went bad. I returned the machine to exchange it and they are not available. I have a brand new (never used) carafe and no coffee maker for it. Does Kuerig still make machines with carafe feature? Hi Bonnie, the K200 is the only model with the carafe feature. They discontinued all other models. You can still find the K475 on Amazon if you like that model more. Is there a am/pm setting for the clock? I’m sure it starts every 12 hours, instead of once every 24 hours. I am on my second pot in three days and can’t program. There are no instructions either ? rushed to market too soon ? I invested in a cutter to recycle the cups but I am discouraged. Cycle through the numbers. PM shows on twelve of them. AM just shows the number. It does not show AM but it is not PM. Thank you for posting this. I’ve been hunting high and low for this. Can’t find AM on the clock!!! Just says pm.. is machine defective? Purchased this new K elite machine because its says it makes” iced coffee” and that sounded great – I already have another Keurig from a 1-1/2 years ago and i just hit the strong button on the 8 oz cup size and then pour over ice. This machine makes it sound like its a cold brew -WRONG – it is the very same – just making the “strong” brew of hot coffee just like their other models and it goes over ice, and the gal had to admit it was the same coffee process. She sounded like Keurig has already been called on this as she was very carefully trying to iterate that the advertising on the box is “brewed coffee over ice” – it does Not make a cold brew as it is a hot coffee maker as all the rest of their lines. THIS IS DECEPTIVE ADVERTISING RIGHT ON THE BOX AND ON THEIR WEBSITE. What I read is you fill your glass with ice, the iced button adjusts the amount of water to compensate for the glass full of ice, brews hot, gets cold from the ice. How in the world do you use my K cup with this machine? It does not fit!!!! Hi, do you have this universal my k-cup filter ? The K-elite works with this filter model and you need to make sure to detach the plus series adapter first so it can fit the machine. If you are using the original universal my k-cup filter but it still won’t fit, I recommend calling Keurig customer service. I just bought the K-Elite and all it does is turn itself on and off. Ive unplugged it, even moved it to a new location. I try to program the clock and it shuts itself off, then turned back on. When I finally get the clock set, it doesn’t keep time. I’ve left it unplugged overnight and when I plug it back in the next day, it shows the same time I had initially tried to set the day before. Hi Patricia, I’m sorry that you’re having issues with your machine. It’s best to call Keurig Customer Service at 866-901-2739 right away, especially since it’s a brand new machine. There is a chance you received a faulty model. Thank you so much for your feedback. What’s interesting to me is that I used the first one for about 3 weeks before it did this, took it back and exchanged it…..this one worked for TWO DAYS!!! Yes, I used several different outlets with nothing else plugged I . Yes all the little sun, moo , mountain icons were set correctly! Yes I phoned customer service ! I am scheduled to receive yet another new machine in a few days….. this will be the last one I try. Makes me sad because we have had Keurigs in the past that were great. Seriously what are the chances that I would get two with the identical problem?? May have to move to a different brand it this new one is a bust? How do say is I to clean? My current Keurig is very difficult to clea (much older model). Hi Bonnie, here’s how to clean your Keurig coffee maker. SO they completely eliminated the carafe option in this new line of coffee makers? that’s correct, the K-Elite is a classic series coffee maker and it doesn’t do the carafe. It only brews regular k-cups.